Anti-Semitism in Kiev? What is our Response? I’ve been thinking all day about a recent article in the Forward that documented the vicious beating of a 25 year old yeshiva student in Kiev – and the Jewish reactions it has engendered. According to the article, Alexander “Aron” Goncharov left the hostel of Kiev’s Brodsky Synagogue on the second night of Passover and never returned. 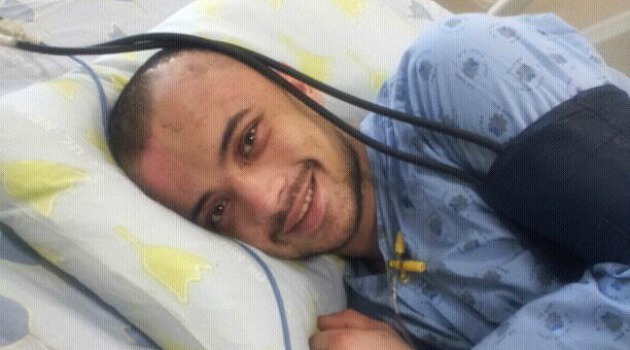 Yeshiva authorities found him the next day in hospital, barely alive after suffering massive head wounds. A few days later, Goncharov was flown to a Tel Aviv hospital for emergency treatment and was put in a medically induced coma. When he awoke one week later, he said that his attackers had yelled “Yid” as they beat him. “I don’t want to say there is no Nazi violence in Ukraine,” Likhachev hastened to say. But he said that Africans and Asians suffer much more than Jews. In an article published soon after the attack, Likhachev noted that on the same night Goncharov was injured, an African student was severely beaten. He said that the following week, a court case opened into a “racist pogrom” which resulted in four students from India, Azerbaijan and Turkmenistan being seriously injured. And this for me is the rub: whether or not this was an act of anti-Semitic violence, what should be our response? For me the answer is clear: it is not to let anti-Jewish actions to drive us from our homes. And it is not to insist that Jews will only truly be safe if they retreat into a nation-state ghetto of their own making. Rather, we must understand Jew-hatred as no different from any other form of prejudice. And if we do agree that this is the case, then it would behoove us to find common cause with all minorities targeted with racism. This entry was posted in Anti-Semitism, Israel, Jewish Community, Zionism on June 3, 2012 by Rabbi Brant Rosen. Your last graph is a very telling statement. It divides the world between those who honor diversity and realize we are all in this together and those who fear differences and mistrust anyone who is not like them. I’m with you on figuring out how to improve this situation, even in a small way. I do find it ironic that someone with the title of “rabbi” and who goes to great efforts to encourage his congregants to spend their Saturday mornings at his congregation instead of going to the golf course or the shopping mall or watching videos, keeps insisting that “Jews are no different than anyone else”, “all forms of ethnic particularism are abhorrent” and now, this latest historical falsehood “Jew hatred is no different than any other form of prejudice”. With all this universalism and love of humanity , I have yet to see any mention whatsoever here of the slaughter going on in Syria, nor have I seen any call for action from this congregation, as American citizens, pressing on their government to to anything about it, even though the human rights situation there is far more acute than anything that is going on at the moment with the Palestinians whom were hear about all the time here. If all people are the same then why is Syrian blood cheaper here than that of the Palestinians? Or is it that the Palestinians receive preferential treatment at this blog simply because they are the enemies of Israel and thus are more fun to empathize with? The horrible things happening in Syria, even Israel didn’t do to us in Palestine. Anybody who says that the Assad regime is with Palestine and that the atrocities happening are in our favor is wrong, and if the freedom of Palestine was dependent on the slaughtering of Syrian children, I would tell you as a Palestinian that I don’t want to be free. While this certainly should not be about “who is suffering more,” I do think it’s important to point out that the Syrian situation has been front and center in the mainstream media for at least a year – and has been met with world-wide condemnation, while the Palestinians’ plight, which is constant and ongoing, has flown well under the media radar – and not only is it not condemned by the West; it is actually enabled and made possible by our country. As I’ve written many times before, as Americans and as Jews, I/we are directly culpable in this situation – and, yes, this is indeed something I try to highlight in my blog. It seems heartless to stand by and do so little as massacres such as that carried out at Houla continue. More than 13 thousand Syrians have been killed in the last 14 months of revolution. All the same US intervention is not the solution. American troops killed over 10 thousand Iraqis in the first month of invasion in 2003. They killed a further 120,000 Iraqis in anger by the time the country was stabilized and safe to leave – and even then Iraq remains in turmoil and a new dictatorship seems to be taking shape. Car bombs are a daily occurrence in Baghdad. In all likelihood, the Syrian revolution will be less bloody if Syrians carry it out for themselves. A new generation of national leaders will emerge from the struggle. They will not emerge with any legitimacy if America hands them Syria as a gift. How will they claim that they won the struggle for dignity, freedom and democracy? America cannot give these things. Syrians must take them. America can play a role with aid, arms and intelligence, but it cannot and should not try to decide Syria’s future, determine winners, and take charge of Syria. If Syrians want to own Syria in the future, they must own the revolution and find their own way to winning it. It is better for Syria and it is better for America. Rabbi Rosen, I very strongly agree with your conclusion in this piece — like you I feel that my Jewishness calls me not only to care about “our” community, but to care more broadly about justice, to see how we are connected, to stand with others who are persecuted or in danger. (This is why I follow your blog, which I appreciate very much). Like you I am skeptical about “political hay” being made from a hateful attack. Sadly, there is a long history of intra-Jewish politicking about who “owns” anti-Semitic violence, and to what “ends” outrage can be used… I agree with your conclusions, and your call for Jews to remain part rather than separate from wider communities, and to pursue justice and safety not just for ourselves, but for everyone. BUT —- I do want to express discomfort about the part of the piece where you entertain the question of whether this had been an anti-Semitic attack at all. I realize that you are merely echoing the questions asked by a social scientist and by some members of the Ukrainian Jewish community, but I’m not sure that we need to understate the anti-Semitic strains of various far-Right nationalisms in order to highlight the other kinds of noxious racisms it goes hand and hand with. Anti-Israeli sentiment still runs high in the former East Bloc countries; it makes complete sense to me that to avoid being considered a sort of “foreign” troublemaker the chief rabbi would have to distance himself from any ‘strident’ claims that anti-Jewish sentiment still exists. And the researcher who stresses that anti-immigrant violence is an even more serious problem….I don’t deny this fact, but to me it makes residual anti-Semitism to the region’s remaining Jews *more* rather than less plausible: seems like a zero sum game to me — as if hate directed against one group could serve as an alibi against prejudice against another… Just as we don’t want to fall into the logic that separates ourselves from others (by speaking out *only* against violence against Jews), we shouldn’t have to minimize the danger to Jews in Eastern Europe just because it is part of a larger picture of hate-fear directed towards minorities. I suspect that the number of anti-Semitic attacks on record has been going down in Eastern Europe for two reasons 1) because so many Jews from the former USSR emigrated and 2) like many of the other racist attacks currently being perpetuated against minorities, they are not counted as such unless there is an outside entity there to make a stink about it. They are swept under the rug. Why do I know this? Because a wonderful young man, a graduate student of my husband’s, went missing in Bialystock, close to the Eastern border of Poland. He reappeared in a coma, having been beaten to within inches of his life. Having been raised in a chasidic community (of which he was no longer a part) he was a native Yiddish speaker whose clothing and topic of research (on Yiddish politics in the early 20th c, which sadly and ironically resonates with the question at hand here — who can make what “political hay” from the legacy of past suffering…) made him visibly Jewish. There has been no press coverage and only the scantest police investigation of the incident, which certainly has not been classified as an anti-Jewish hate crime. With the World Cup approaching, co-sponsored by Poland and Ukraine, the possible danger to players and spectators of color have been widely discussed in the European press; and friends from the region have often spoken to me of their concern about gay friends and colleagues still living there. I sincerely hope that there are no racist attacks this summer, but of course, if there are, I join you in hoping that public figures speak out publicly against all of them, and that the Jewish community is there pressing them to take steps to ensure the safety of all minority citizens, immigrants and visitors. Thank you, Claire, for your thoughtful response. I am so sorry to learn about your husband’s student. Of course I do not for a minute want to suggest for a moment that anti-Semitism is not a problem in Eastern Europe. To be clear, I didn’t raise the issue of other forms of racism in order to “minimize” the danger to Jews – quite the opposite. I do believe intolerance towards Jews is part of a larger form of prejudice in general toward “others” – and that the way to combat it is not to build bigger walls between ourselves and the outside world, but to create relationships and coalitions with all who suffer from these kinds of heinous hate attacks. We’ve certainly come a long way since the Russian and Ukrainian government’s themselves were responsible for instigating pogroms against Jewish communities. Historically, the most ominous form of anti-Semitism faced by Jewish communities has been the officially sanctioned kind – not the street anti-Semitism such as occurred recently in Kiev. All of this is not to downplay these tragedies, but rather to put them in proper perspective so they we may ultimately address them more effectively. Thanks for your kind words, Claire, and thanks for reading!